FORT WORTH, TEXAS (April 19, 2011) The Bell Helicopter Armed Forces Bowl will return to Dallas for the second-straight year as the ninth edition of the nationally televised postseason college football bowl game on ESPN will be played Friday, Dec. 30, at SMU’s Gerald J. Ford Stadium with an 11 a.m. CST kickoff. Due to renovations at TCU’s Amon G. Carter Stadium, the 2010 Bell Helicopter Armed Forces Bowl was played at Gerald J. Ford Stadium in Dallas where a facility record crowd of 36,742 watched Army post a 16-14 win over SMU. The 2011 Bell Helicopter Armed Forces Bowl currently features a matchup between schools from Conference USA and the Mountain West Conference. The Bell Helicopter Armed Forces Bowl, which is scheduled to return to Amon G. Carter Stadium in 2012, has featured a military theme since 2006. Patriotic overtones recognizing all five branches of the military are prevalent throughout the game. Past Bell Helicopter Armed Forces Bowls have included fan-fest areas showcasing military hardware; flyovers; demonstrations by several of the military’s top skydiving teams; on-field induction ceremonies; military bands and honor guards; and the awarding of the annual “Great American Patriot Award” (GAPA) presented by Armed Forces Insurance. TCU announced a $105-million renovation of the west side and north end zone of Amon G. Carter Stadium in August 2010 to upgrade amenities and transform the historic Fort Worth icon into the "Camden Yards" of collegiate football stadiums. Construction began immediately following TCU's final 2010 home game and is slated for completion prior to the Horned Frogs’ 2012 regular season. Bell Helicopter, a Textron Inc. company, joined the bowl on August 23, 2006, as the title sponsor of the postseason college football game formerly known as the PlainsCapital Fort Worth Bowl (2003, 2004) and the Fort Worth Bowl (2005). 2006 marked the first year for the adoption of the “Armed Forces Bowl” name, making the official title the Bell Helicopter Armed Forces Bowl. Bell Helicopter has twice exercised its option for title sponsorship of the game. The current agreement was signed in Septembe r 2009 to continue the sponsorship for the 2010 and 2011 games with a two-year option for 2012 and 2013. BRIDGEVIEW, ILLINOIS (April 24, 2011) The Houston Dynamo Reserves suffered their first loss of the 2011 season Sunday morning, falling 3-0 to the Chicago Fire at the Toyota Park practice field in Bridgeview, Ill. Houston is now 1-1 on the season, with its next match scheduled for Sunday, May 15. Chicago took the lead in the 16th minute when Orr Barouch played a pass into the penalty area for forward Gabriel Ferrari. Dynamo defender Eddie Robinson broke up the play but saw the ball deflect behind goalkeeper Tyler Deric and inside the right-hand post. The Fire went ahead 2-0 in the 27th minute on a counterattack following a Houston corner kick. Daniel Paladini played a long ball to Gabriel Ferrari, who slipped a pass to Martin Rivas at the top of the box, where he created space and fired a shot into the lower left corner. Chicago made the score 3-0 in the 41st minute when left back Pari Pantazopoulos broke into the penalty area and fed Rivas. His first shot was denied by a sprawling Deric, but Rivas slotted home the rebound for his second goal of the game. Houston controlled the second half, outshooting Chicago and going close through Alex Dixon and Je-Vaughn Watson, but Chicago goalkeeper Sean Johnson finished with four saves to earn the shutout. The Dynamo used four current Dynamo Academy players in the match, with Ábe Matamoros (Strake Jesuit) starting in midfield and Bryan Celis (Katy Mayde Creek), Miguel Zapata (Katy Mayde Creek), and Christian Gonzalez (Spring Woods) all entering as substitutes. HOUSTON,TEXAS (April 24, 2011) Houston – Rice’s women’s track and field squad collected four first place finishes at the eighth annual J.Fred Duckett Twilight held on the Rice campus at Holloway Field and Ley Track. Morgan Mayse, who recently completed her fourth season as a member of the Owls’ women’s basketball team, won the high jump event in her first track and field competition since her high school days. Mayse jumped a team season-best 1.71m/5-7.25. In the discus, Sharae Robinson was first with a mark of 46.83m/153-8. Her sister, Tina, captured the hammer throw event with a mark of 51.45m/168-9. Ari Ince won the javelin with a distance of 43.45m/142-7. Candace Springer, ran a season-best 200m (25.09) to place eighth. Sarah Lyons ran a season-fast 400m (55.50) in placing fourth and Lillian Nwora was seventh (57.63). Kylie Cullinan was sixth in the 800m with a time of 2:15.45. Alex Gibbs placed third in the 100m hurdles with a time of 14.51. Cullinan also placed fourth in the 1500m with a season-best time of 4:38.36 and Nicole Mericle was seventh (4:42.51). Sarah Agara placed third in the triple jump with a mark of 11.89m/39-0.25. Also in the discus, Brittany Brown was sixth (40.05m/131-5) in the discus, while Sharae Robinson posted a season-best mark to place second in the hammer throw (48.93m/160-6). Brown was also sixth in the hammer (45.13m/148-1). In the shot put, Tina Robinson was third with a mark of 13.45m/44-1.5. CHICAGO, ILLINOIS (April 23, 2011) The Houston Dynamo extended their unbeaten streak to five MLS games and their road unbeaten streak to six games with a come-from-behind 1-1 tie against the Chicago Fire Saturday night in Bridgeview, Ill. Defender Bobby Boswell scored the game-tying goal in the 83rd minute to give Houston a deserved road point. The Dynamo are now tied for third place in the Eastern Conference, trailing first-place New York by two points. Houston returns to action with back-to-back home games, hosting D.C. United in a nationally-televised Orange Out Friday night game this week and then taking on defending MLS Cup champion Colorado on Wednesday, May 4. Although the Dynamo controlled outshot the Fire 15-11 and controlled 61 percent of possession, Chicago struck first in the 18th minute. After Houston appeared to break up a counterattack, Fire midfielder Marco Pappa, while on the ground, flicked a pass into the penalty area, where forward Diego Chaves ran onto the ball and scored his fourth goal of the season. Houston pressured Chicago throughout the first half, forcing eight corner kicks, but did not get a shot on goal. Early in the second half, both teams came close with shots, as Houston’s Lovel Palmer fired off the post from long range in the 47th minute and Chicago’s Dominic Oduro rang the crossbar in the 66th minute. The Dynamo found a tying goal in the 83rd minute on their 10th corner kick of the night when Brad Davis played the ball toward the far post and defender Bobby Boswell met it with a header that nestled just inside the opposite post to tie the game. The goal was Boswell’s second of the season, the second-highest total of his career after he netted three as a rookie in 2006. The dramatic goal came almost three years after Boswell scored the game-winning goal for Houston at Chicago on an 85th-minute header in May 2008. For Davis, the assist was his fourth of the season, second in MLS behind Vancouver’s Davide Chiumiento (5). The match included seven minutes of stoppage time at the end of the second half due to several injuries and delays, including a clash of heads between Houston’s Cam Weaver and Chicago’s Yamith Cuesta. Both players returned to and completed the match. With the tie, Houston extended its road unbeaten streak to six games (2-0-4), including all three away games in 2011 by a 1-1 margin. The club record for road unbeaten streak is seven games, set in the team’s inaugural season of 2006. The Dynamo are now unbeaten in five consecutive games overall (2-0-3) and 3-1-2 all-time at Toyota Park. Jamaican international midfielder Je-Vaughn Watson entered the match as a substitute in the 78th minute, making his Dynamo and MLS debut. Dynamo midfielder Geoff Cameron played his 100th game for the Dynamo in all competitions, becoming the 14th player in club history to reach that milestone. Defender Corey Ashe moved into a tie for fifth place in club history by appearing in his 140th game, tying assistant coach Wade Barrett. Midfielder Brad Davis made the 190th start of his MLS career, defender Bobby Boswell played in his 170th career MLS game, defender Hunter Freeman played in the 90th game of his MLS career, midfielder Lovel Palmer made his 35th start for Houston in all competitions, and midfielder Danny Cruz made his 25th start for the Dynamo in all competitions. The Dynamo played without forwards Calen Carr (concussion), Brian Ching (rib separation), and Sergio Koke (visa); midfielder Francisco Navas Cobo (hamstring); and defender Jermaine Taylor (foot sprain). LEXINGTON, KENTUCKY (April 24, 2011) Adam Bailey's single drove in Delino DeShields Jr. with the tie-breaking run in the eighth inning, and the Lexington Legends held on for an 8-7 win over the Savannah Sand Gnats Saturday night at Grayson Stadium. DeShields walked to lead off the eighth, and as he stole second, catcher Blake DeShields to reach third. Bailey, who had three hits to extend his hitting streak to 10 games, then lined a single to right field to drive in DeShields, breaking the 7-7 tie. Ruben Alaniz (2-1) got the win in relief. Gabriel Garcia, who worked the eighth and ninth, earned his first save by escaping a two-on, two-out threat in the ninth when he struck out Aderlin Rodriguez to end the game. Luis Rojas (0-1) was the losing pitcher. Bryce Lane's three-run triple in the fourth inning helped the Legends come back from an early 4-0 deficit. The Legends' Jiovanni Mier hit his second home run of the year, a solo shot in the fifth inning. Chris Wallace had three hits in four at bats to raise his average to .419. HOUSTON, TEXAS (April 23, 2011) The University of Houston baseball team lost its series finale against the East Carolina Pirates, 12-2, in seven innings Saturday afternoon at Cougar Field. With the loss, Houston drops the series against the Pirates,1-2. Houston now stands at 20-21 on the season and 7-5 in Conference USA play. Junior Mo Wiley fell to 2-2 on the mound, giving up three runs on four hits in 3.2 innings. The Cougars then used six relief pitchers to close out the contest. Sophomore Chase Jensen finished 3-for-4 at the plate with a run scored and an RBI. Senior Caleb Ramsey and junior Matt Creel each added two hits for Houston. East Carolina leadoff batter Ben Fultz got the Pirates off to a quick start with a home run to right field to start the game. Trent Whitehead then put the Pirates up 3-0 in the fourth inning with ECU’s second home run of the game. He would score Zach Wright on the play after he reached base on a single to right field. With two outs, freshman Travis Jenkins would enter the game in relief, walking his first batter before giving up a double to the left field corner that allowed the base runner to score. Jensen answered for the Cougars in the bottom of the fourth inning. He led off with a single to left field, moved to second on Shawn Armstrong’s balk and advanced to third on sophomore M.P. Cokinos’ fly out to center field. Junior John Cannon’s groundout to the shortstop would allow Jenson to score and the Cougars to pull withinthree of the Pirates, 4-1. The Pirates would pull away in the fifth inning, scoring six runs, including two home runs, to take a 10-1 lead. The Cougars scored their final run in the bottom of the inning. With one out, Ramsey doubled down the left field line and scored onJensen’s single to right center field. East Carolina would seal the win and close out the game, scoring two runs in the sixth inning. The Cougars will have a busy week ahead of them, as they will play five games on the road next week. The week begins at Stephen F. Austin at 3 p.m. Tuesday and continues against Lamar at 6:30 p.m. Wednesday. Following the midweek action, Houston will travel to Orlando for a three-game series against UCF, April 29-May 1. Yolle Lemberger, exhibits designer for iFest, spent over two months designing and building the structure. The 2011 event spotlights The Silk Road: Journey Across Asia April 30-May 1 and May 7-8, 2011, with world musical performances, international arts and crafts markets, artisan demonstrations, interactive exhibits and plenty of food and fun for all ages. The Trojan Horse, which will be located at the Chevron Silk Road Museum in Sam Houston Park, is a reproduction of the famous Trojan Horse from the ancient city of Troy, which was located in Turkey, an important stop along the Silk Road. The 2011 Houston International Festival is open from 12 -10 p.m. Saturdays, 12 - 8 p.m. Sundays. Tickets are on sale at the festival website at www.ifest.org and participating H-E-B Grocery locations. Prices are $12 in advance, $18 at the gate, with kids 12 and under admitted free on Sunday, May 8, courtesy of ConocoPhillips. On the other days, children’s tickets are $3. All proceeds benefit the Festival arts and education programs. For more information, call 713-654-8808 or access the Festival’s official website at www.ifest.org. HOUSTON, TEXAS (April 22, 2011) Junior Jordan Lewis struck out 10 batters and allowed just one earned run to guide the University of Houston baseball team to a 4-2win over East Carolina Friday night at Cougar Field.With the win, Houston tied the series with the Pirates 1-1, with the finale set for 1 p.m. Saturday. Lewis pitched seven innings to improve to 4-1 on the mound. He gave up two runs, one earned, on five hits to go along with his 10 strikeouts. Junior Jordan Mannisto collected his third save, pitching the final two innings of the game. At the plate, senior Caleb Ramsey was 2-for-4, while sophomore Chase Jensen tripled and scored a run. Houston traded runs with the Pirates in the third inning. After giving up an unearned run on a Lewis error, Ramsey singled to center field, allowing freshman Landon Appling to score from first base. In the fourth inning, Sophomore M.P. Cokinos singled up the middle and junior John Cannon put runners on first and second base with a walk. Junior Matt Creel moved the runners into scoring position before junior Codey Morehouse’s bunt down the first base line gave Cokinos the chance to score. After a double to lead off the seventh inning, Morehouse would give UH its final run total, scoring on senior Ryan Still’s sacrifice fly to left field. The Pirates closed out the game with a run in the eighth inning. Houston will close out the series against East Carolina on Saturday. First pitch is set for 1 p.m.
HOUSTON, TEXAS (Apeil 21, 2011) The University of Houston baseball team gave up three runs in the ninth inning, allowing the East Carolina Pirates to earn a 5-4 comeback win in 12 innings in the series opener Thursday night at Cougar Field. With the loss, Houston falls to 19-20 on the season and 6-4 in Conference USA play. UH held a 4-1 lead when Chase McDonald began a three-run rally with a home run in the bottom of the ninth inning. Back-to-back singles put two runners on base before Ben Fultz tripled to right center to tie the score, 4-4. The score remained tied until the 12th inning when Trent Whitehead singled to left field, allowing Jack Reinheimer to score after leading off the inning with a walk. In his first appearance on the mound since the 2009 season, junior Jared Ray pitched four solid innings. He gave up one run on three hits with a strikeout. Sophomore M.P. Cokinos had a successful day at the plate, connecting on two hits with two RBIs. Junior John Cannon added two hits and scored a run. After the Pirates took a 1-0 lead in the third inning, Cannon tied the score in the fifth on a wild pitch by ECU pitcher Mike Wright. The Cougars took control of the game in their next at bat. With the bases loaded, Cokinos doubled to left field and Fultzmishandled the ball allowing three runs to score and the Cougars to take a 4-1 lead. The series against East Carolina will continue at 6:30 p.m. Friday with the finale against the Pirates scheduled for 1 p.m. Saturday. 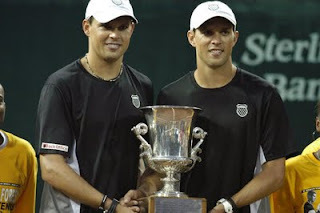 HOUSTON, TEXAS (April 9, 2011) The doubles team of Bob and Mike Bryan added another title to their impressive resume by winning the 2011 US Men’s Clay Court Championships at River Oaks Country Club in Houston. The Bryan brothers came from behind in defeating the team of John Isner and Sam Querrey 6-7 (4), 6-2, 10-5. After loosing the first set and winning the second 6-2 the Bryan's rallied back to down their opponents in the third set 10-5 in the third set super tie-breaker. The Bryan’s also claimed their 10th career major title earlier this year by winning the Australian Open. The victory was their fourth in the tournament in Houston and their 69th in the ATP. Their win netted them $ 24,500 and 250 ATP ranking points. The number one doubles team in the world has a following in Houston, winning their fourth title in the Bayou City before of a sold-out crowd. The brothers, who have won 16 straight games in Houston, got to the championship match by downing in the semifinals of the couple formed by Guillermo Garcia-Lopez and Pablo Cuevas in the semifinals, 7-5, 6-1. SAN MARCOS, TEXAS (April 9, 2011) Playing their first home match since March 13, the Texas State women’s tennis team came back to capture a pivotal doubles point and went on to defeat Texas A&M-Corpus Christi 5-2 in a Southland Conference match on Saturday afternoon at the Bobcat Tennis Complex. The Bobcats began the match with Melissa Hadad and Jessica Kahts winning the No. 1 doubles match over Sandra Burgess and Mirna Cicak 8-6. In the No. 3 match, Jessica Laing and Mariana Perez suffered an 8-6 setback against Mia Matuszak and Stefania Nicolae. In the pivotal No. 2 match, Gabriela Rojas and Berenice Van Den Bergh was trailing 5-1 against Texas A&M-Corpus Christi’s Bianca Discordia and Doris Kuselj, before they came back to score seven of the final eight points to win the match 8-6 and give the Bobcats the doubles team point. After winning the doubles point, Texas State came back and won four of the six singles matches. Van Den Bergh began singles play with a 6-0, 6-3 victory over Matuszak in the No. 6 match. Van Den Bergh was ahead in the second set by a score of 4-1, before Matuszak won two straight points to pull to within 4-3, but Van Den Bergh came right back to score the final two points in the match. In the number 2 match, Hadad also won 6-3, 6-2 over Kuselj after she scored the final three points in the second set. Hadad held a 2-1 lead before she and Kuselj split the next two points to set up her rally. It marks the third straight win for Hadad as she improved her dual match record to 9-6, which is the best record for the Bobcats this spring. Rojas clinched the victory with a 6-3, 6-4 victory over Discordia in the No. 3 match. Rojas trailed 3-2 in the second set of her match before she came back to score five of the final six points in the match and pull out the victory. Texas A&M-Corpus Christi won their first singles match when Nicolae defeated Jessica Laing 6-3, 7-5. The other victory for the Bobcats came in the No. 5 match when Perez came back after losing the first set by a score of 6-1, and won the second set 6-2. Then, she won the super tiebreaker by a score of 10-2. Kahts also took her No. 1 match against Cicak to three sets. Cicak won the first set 7-5, before Kahts came back to win the second set by a score of 6-3. In the super tiebreaker, Kahts trailed 5-1 before winning five of the next eight points to pull to within 8-6. However, Cicak won the final two points to clinch the victory. Texas State will play their final home match of the season on Sunday when they play host to UTSA in the annual I-35 Maroon vs. Orange rivalry at the Bobcat Tennis Complex, That match begins at 1:00 p.m. The Bobcats conclude the regular season with road matches at Nicholls and Southeastern Louisiana. The victory over Texas A&M-Corpus Christi improves Texas State’s record to 8-7, and the Bobcats are 4-4 against Southland Conference teams. Texas A&M-Corpus Christi fell to 8-4, and the Islanders are 5-3 versus SLC teams heading into their match at UT Arlington on Sunday. HOUSTON, TEXAS (April 9, 2011) The University of Houston football team closed out the spring season Saturday afternoon at Robertson Stadium as the White Team (defense) outscored the Red Team (offense) in a 43-34 victory. The White Team took advantage of a scoring system that rewards defensive plays, racking up 43 points on six sacks, seven drive stops, four 3 & outs, one fourth-down stop, one interception and one missed field goal. Redshirt freshman linebacker Jon Witten led the defensive charge, totaling 10 tackles, including two for a loss and a sack. Alex Tillman added nine stops and broke up two passes, while Kris Johnston racked up eight tackles from the linebacker position. Junior linebacker Phillip Steward posted a game-high two sacks for a loss of eight yards, while D.J. Jones provided the contest’s lone interception, returning the pick 26 yards. The offensive unit put up 643 total yards, including 507 in the air by four different quarterbacks. Cotton Turner led the Houston signal callers, completing 16-of-24 attempts for 162 yards and two touchdown strikes. Crawford Jones added 157 yards on 16 completions, while David Piland was 14-of-20 for 127 yards and a touchdown pass. Junior running back Chris Wilson registered the lone touchdown on the ground, punching it in from one-yard out to cap off the 80-yard opening drive. Ronnie Williams made a bobbling catch in the corner of the end zone for a 21-yard touchdown reception from Turner to put the Red Team up 14-9 with 2:17 remaining in the first quarter. Williams ended the afternoon with seven catches for a team-leading 79 yards. Junior kicker Matt Hogan converted a 52-yard field goal midway through the second quarter and followed up with a 57-yard boot to cut the deficit to two points for the Red Team with 3:31 remaining in the second quarter. Both of Hogan’s field goals surpassed his career high of 51 yards. Piland tossed a touchdown strike to Isaiah Sweeney in traffic with 1:46 left to play until the half, as the junior receiver eluded a defender and took it 34 yards for the score. Turner led the Red Team down the field to open the third quarter, capping off the drive with a 12-yard strike to Marcus Wiliams to put the squad up 34-29. The defense would take over from there, scoring the final 14 points on two sacks, two drive stops, an interception and a missed field goal. Redshirt freshman running back Randall Hollimon led the ground attack with seven rushes for 62 yards.Junior Braxton Welford added 40 yards on eight carries. Darian Lazard grabbed agame-high nine catches for 74 yards, while DeAndre Perry added five catches for 68 yards. Houston will open the 2011 season on Sept. 3 against UCLA at Robertson Stadium. HOUSTON, TEXAS (April 3, 2011) Minnesota Wild General Manager Chuck Fletcher today announced the National Hockey League (NHL) club has recalled forwards Colton Gillies and Carson McMillan from the Houston Aeros of the American Hockey League (AHL). Gillies, 22 (2/12/89), has appeared in three games with Minnesota making his season debut Oct. 28 vs. Washington and has not recorded a point. He has posted 26 points (11-15=26) and 82 penalty minutes (PIM) in 64 games for the Aeros this season. The 6-foot-4, 208-pound native of White Rock, B.C., skated in 45 games with Minnesota in 2008-09 and tallied seven points (2-5=7). Gillies was selected by the Wild with the 16th overall pick in the 2007 NHL Entry Draft. McMillan, 22 (9/10/88), has tallied 22 points (10-12=22), 80 PIM and a team-best three shorthanded goals in 78 games with Houston this season. The 6-foot-2, 194-pound native of Brandon, Manitoba has not appeared in a NHL game. He was selected by Minnesota in the seventh round (200th overall) of the 2007 NHL Entry Draft. McMillan wears No. 45 with the Wild. NEW ORLEANS, LOUISIANA (April 3, 2011) Junior Mo Wiley turned in eight scoreless innings on the mound to lead the University of Houston baseball team to a 9-0 win over Tulane, completing the series sweep, Sunday afternoon at Turchin Stadium. Wiley gave up nine hits and struck out two batters in a career-long outing. Senior Taylor Hammack closed out the contest, pitching the final inning. During the series with the Green Wave, the Cougars allowed only eight Tulane batters to advance to third base and they gave up just two runs in 27 innings. With the win, Houston (15-14, 3-0 C-USA) is the only undefeated team in Conference USA and has swept a league opponent on the road for the first time since a trip to Marshall on April 24-26, 2009. The Cougars are also in the final games of a nine game stretch against ranked opponents as the Green Wave was No. 27 in the latest baseball polls. After two scoreless innings to open the contest, the Cougars loaded the bases in the third inning with three straight singles before senior Caleb Ramsey doubled down the right field line to put UH up 2-0. Sophomore Chase Jensen added to Houston’s run total on the next at bat with a two run single to right field. Ramsey added to the Cougars lead in the fourth inning, with the bases loaded he singled to right field allowing two runs to score. Houston would score in the third straight inning when junior Matt Creel scored on junior John Cannon’s sacrifice fly to right field in the fifth inning. UH posted two runs in the seventh inning for their final run total of the game. With one out, Cokinos singled to center field and advanced to second on a wild pitch. A dropped fly ball to right field allowed Cannon to advance to third and score Cokinos. Junior Austin Gracey followed with a double down the left field line to send Cannon to home plate. UP NEXT The Cougars will play five games next week, beginning with a trip to College Station, Texas. The Cougars will play Texas A&M at 6:35 p.m. April 5 before returning to Cougar Field for a contest with Lamar at 6:30 p.m. April 6. UH will then continue league play with a three-game series against UAB, April 8-10. HOUSTON, TEXAS (April 2, 2011) With a wham and a bam and not even so much as a “thank you m’am,” the Butler Bulldogs downed a stubborn, yet determined Virginia Commonwealth team 70-62 to return to the title game for the second year in a row at the 2011 NCAA Division 1 Men’s Basketball Championships. Playing before a capacity crowd at Houston’s Reliant Stadium, the Bulldogs proved their trip to the championship game in 2010 was not a fluke, where they eventually lost to the Duke Blue Devils 61-59. In a game marred by poor shooting, the Bulldogs managed to outlast VCU. Both teams shot less than 40% from the field. Butler was 21 of 59 (35.6%) from two-point range, while VCU chipped in a mere 23 of 58 attempts (39.7%). Both teams were about equal from three-point range, with Butler hitting 8 of 23 (34.8%) and VCU making 8 of 22 (36.4%). Shevin Mack led all Butler with 24 points, with Matt Howard adding 17 and Shawn Vanzant chipping in 11. VCU’s Jamie Skeen scored 27 points for the Rams with Bradford Burgess adding 15. In the end, rebounding was the key. Butler out-rebounded VCU 48 to 32 and VCU head coach Shaka Smith was quick to note that fact in the post-game press conference. “That was a big part of it. I think you can’t get out-rebounded by 16 in a game and expect to win," he said. Smith also was critical of some of the easy shots that the Rams missed, saying, “[To] be honest with you, we missed a lot of easy shots, too, that if those things go down, instead of being down four late, we might be up two or four. So there are a few different factors that came into play, but again, Butler was better and they deserved to win." Butler head coach Brad Stevens said, when questioned on pulling away at the end of the game, “That was two really good teams. VCU has a lot to be proud of. They inspired a lot of people, including us. They played terrific all the way through." Stevens and his Bulldogs will have to wait until later Saturday evening to find out who they will face in Monday night’s championship final. Kentucky and Connecticut will face off in the nightcap at Reliant Stadium to determine the other finalist.